Can you believe it's already October?! I thought it would be fitting to start of this month with my newest favorite pumpkin recipe. This recipe is from Joy the Baker, which means it's delicious, but it also is actually a vegan recipe. I'm not vegan by any means, but I think it's good to know a few good recipes of the vegan or gluten-free type when baking or cooking for others with those dietary preferences. This recipe makes two loaves so I stuck one in the freezer to have on hand when we have company later this month. Happy Monday! Place a rack in the center of the oven and heat oven to 350 degrees. Grease and flour two 8x4x3-inch loan pans and set aside. In a large bowl, whisk together flour, sugar, baking soda, baking powder, salt, and cinnamon. In a medium bowl, carefully whisk together pumpkin puree, oil, maple syrup, and water. Add the oil mixture all at once to the flour mixture. Use a spatula to fold the ingredients together. Make sure to scrape the bottom of the bowl well, finding any stray bits of flour and sugar that might have been left behind. Fold in the chopped pecans or chocolate chips. Divide the batter between the prepared pans. Bake for 60-75 minutes, or until a skewer inserted into the center of each loaf comes out clean. Remove from the oven. Let rest in the pans for 20 minutes on a wire rack, then remove loaves from pan. Loaves can be wrapped and kept at room temperature for up to 5 days. This bread also freezes well; leave at room temperature to thaw. Yum, awesome that its vegan too! I am so mood for all things pumpkin right now! You know, I had pumpkin bread for breakfast today! This looks like a great recipe Sherri! Mmmm fall. Anything pumpkin screams fall to me though. Hope you had a good weekend! oh mannnnnnnnnnnn - thank you for this sherri lynn! i have all the ingredients at home so the chances of me making this are extremely high. when i freeze a loaf should i wrap in plastic wrap, aluminum foil, or something else? thanks! Oh wow. This looks absolutely delish! I really need to try this pumpkin bread. I've been craving some! We use to buy it at The Fresh Market, but alas, we don't live near it anymore so I guess I should make my own! Looks amazingggg! 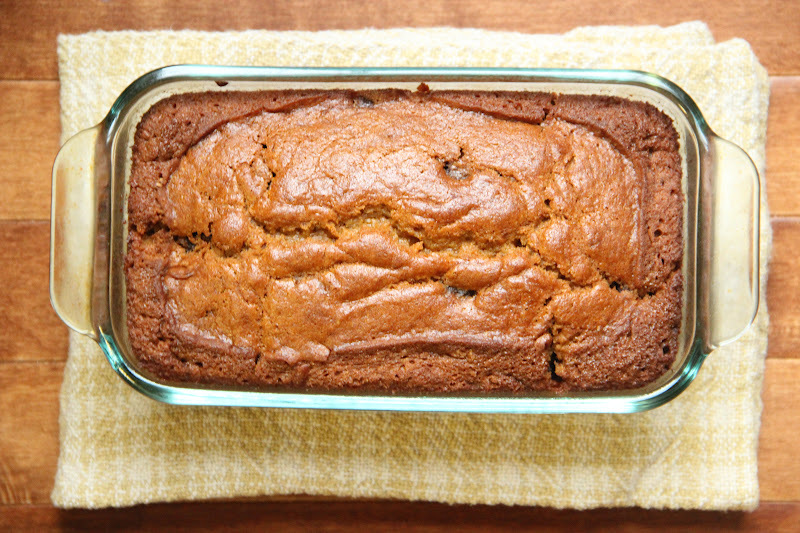 I love how pumpkin bread makes your whole house smell like a delicious bakery..mmm!